Robert Pilot was born in St. John’s, Newfoundland in 1898. Although from childhood he was a protégé of his stepfather, the Impressionist Maurice Cullen, Pilot slowly achieved a subtle interpretation of Impressionism that bears his own modest stamp. He moved to Montreal in 1910. After studying at the Art Association of Montreal under William Brymner – a strong advocate of individual expression – Pilot travelled to Paris in 1920 to work with Jean-Paul Laurens (1838-1921) at the Académie Julian, a favourite atelier for many Canadians. In Paris, he frequented museums and private galleries to study the avant-garde movements of the time in the hope of finding a clue to his own creative future, finally deciding with his own neo-Impressionist bent. Although he made many painting trips abroad to England, France, Italy and North Africa, Pilot was always drawn back to Quebec. In a letter to the author, February 22, 1956, he remarked “I found the light of North Africa so much harsher than at home. I never felt comfortable there as Morrice did. I guess my palette was too muted a one to go all out after the colour and contrasts I found there”. Pilot found the snow-laden streets of Quebec City and its neighbouring villages much more congenial to his temperament. He died in 1968 in Montreal. 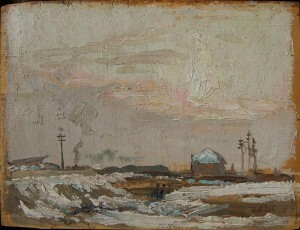 His views of the province of Quebec, and in particular of Quebec City, are engaging examples of atmospheric painting. He evoked the character of Quebec City with affection or persuasion. Pilot’s images of that ancient capital, whether seen from across the St. Lawrence at Lévis, or in close-ups of Dufferin Terrace, Mountain Hill, or Governor’s Garden, remain his richest legacy. Despite their tonal subtleties, Pilot’s paintings are very directly executed, reflecting an easy authority of technique and his close knowledge of his themes. Pilot was a master of twilight, that transient time of day when artificial lamps and natural light are joined in the same vibration. That insubstantial effect is at its most magical in winter, when the dominant fields of white reflect both light sources, placing every form within an identical tonal fabric. Pilot found his ideal in its soft ambience, using a palette of mauves, greys, and broken blues. There are no novelties in Pilot’s oeuvre, but, because of their intense sincerity and the affection they express, his Quebec images linger in the mind’s eye. They are quiet images, by an artist who was an academician. This entry was posted in Biographies, Robert Pilot and tagged canadian artist, paintings, robert w pilot, robert wakeham pilot rca by lacorniche. Bookmark the permalink.